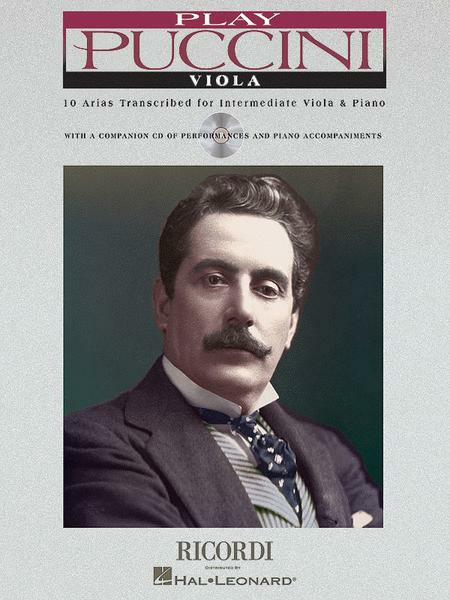 10 Arias Transcribed for Viola & Piano. Composed by Giacomo Puccini (1858-1924). Instrumental Play-Along. Play Along. Softcover with CD. 40 pages. Published by Ricordi (HL.50484653). ISBN 0634046357. 9x12 inches. Book/CD Packs. Who needs a singer? With Play Puccini, instrumentalists can bathe themselves in luxurious Italian melody! These ten opera arias are among the composer's most famous and distinctive achievements, here transcribed for intermediate level solo instrument and piano. The book includes a biography of Puccini, notes about the plot of each opera, and the dramatic context of the selected aria. The companion CD features excellent performances, as well as piano accompaniments for practice. Includes arias from: La Bohème, La Fanciulla Del West, Gianni Schicchi, Madama Butterfly, Manon Lescaut, Suor Angelica, Tosca and Turandot. Viola & Piano-43 Famous Comps. February 21, 2007 WRONG KEYS! 21 of 32 people found this review helpful.